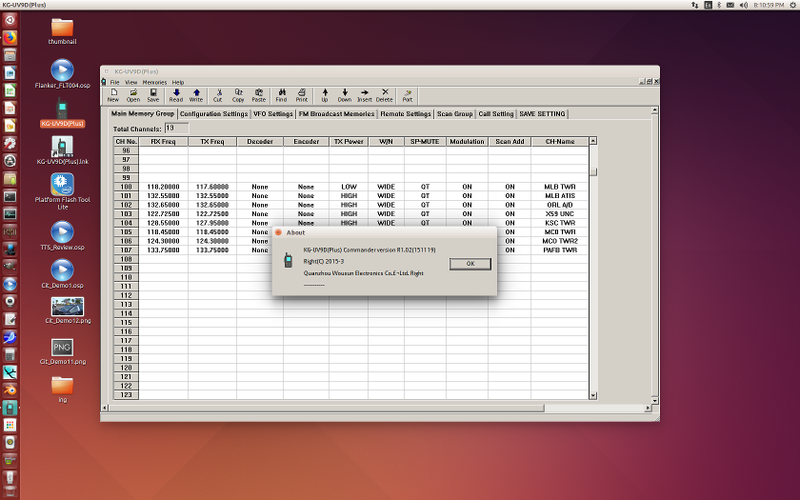 The Wouxun KG-UV9D(plus) "Official" Programming software works on Linux/Wine ! To be clear -- This article is about running the "official", proprietary Wouxun Programming software. We are not talking about CHIRP, or any other Open Source Ham Radio Programming software. Obviously, the official one should work. Perhaps not pretty, but I can verify that the same cable as described in the linked article work for the KG-UV9D(plus). Again, I recommend performing the command to install the Stable-branch. -- Run winecfg to create a Windows "C" drive, and configure wine. During the first wine startup, it will ask you to install 2 missing components, one is for Windows .NET, and one is for Windows programs that use embedded HTML. Answer "Yes" or "OK" to both. You do not have to change or configure any windows settings, just hit "OK". -- Make the cable accessible to the user. Replace [your_user_name] as appropriate, without the brackets. "Drivers" for the cable are not needed on Linux. 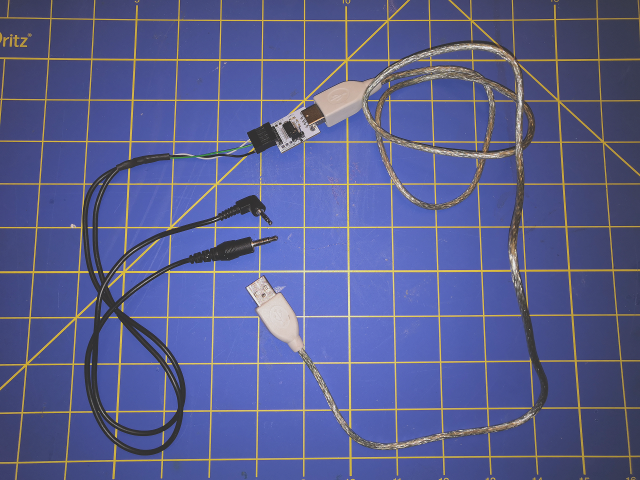 NOTE: The cable (or FTDI adapter) must be connected to the computer in order to have a /dev/ttyUSB0. This removes the old link, and then links ttyUSB0 (the programming cable) to Windows COM1. If you have other USB serial devices connected, change the line above to match the correct USB device. Find the downloaded file UV9DP_SEN.rar in your Downloads directory. Right-click it, and choose "Extract Here". Find the resulting Installer file KG-UV9D(Plus) setup.exe, which should be in the same directory. Run the installer, and answer the prompts as normal. Select install shortcuts for a single user, when asked. This should create a link on the desktop as shown on the screenshot above. Alt-A --> O (letter "o") --> Serial port setup --> E --> (use a and b keys to select 2400) --> verify 2400 8N1 at the top --> Hit Enter twice to save, then select Exit --> Alt-A --> Q to quit minicom without reset --> Yes. Click "Read" (Downward Facing Blue arrow), and it should read the data from the radio. The radio will reboot after a successful Read or Write. Apparently, this is normal. Suggestion: Save your radio settings file outside of the .wine directory. This way, you can remove/upgrade/etc. your wine environment as you wish, and you will still have your settings saved. Back up your settings files as part of your regular Linux backup. run winetricks, and select "Select the default wineprefix" "OK" --> "Install a Windows DLL or component" "OK", and then select mfc42 and msvcirt. vcrun6 and vcrun6sp6 should already be selected. Hit "OK". When it competes, try to run the Wouxun app again. -- Wouxun programming software runs, but will not connect. Check the serial port settings. minicom can be used as a serial sniffer to help understand what is happening. Try reversing the TX and RX wires on the FTDI board (home made cables only) as mentioned in the article referenced above. If the cable is disconnected, and then re-connected, it may re-enumerate to /dev/ttyUSB1 (or another number). Disconnecting the cable from the USB port, waiting a few seconds, and then reconnecting it should set it back to the lowest available ttyUSB device number. USB devices should be at the end of the list. -- It did correctly update for the US end of DST !! -- On the main settings page, if one changes the time zone, or the time server, and then presses the keyboard enter button instead of clicking the Submit button, it would not save the settings. This has been fixed by simply changing what is looked for in the post response. -- In time only mode, code was added to move the time on the display to maintain uniform display brightness. Since the time display in 24 hour mode is shorter (fewer characters) than time in AM/PM format, in 24 hour format, it will favor the left of the display, and never use the last few characters of the display. These have been fixed, and will be in the next .tar.gz I upload. 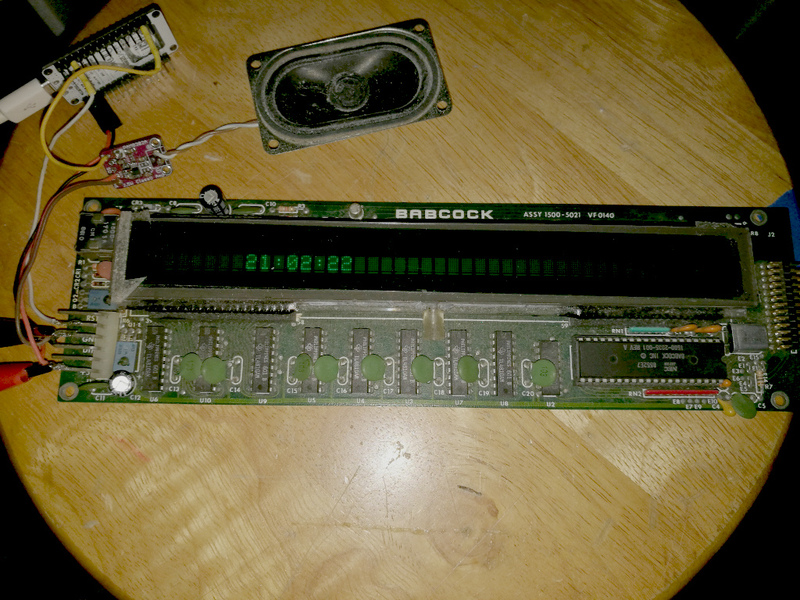 Here's a picture of my development clock, using a 40 character dot matrix VFD. It is running the 20 character code, however. page for future status and issues list. This separate thread is deprecated. -- Spring Forward and Fall Back were tied to wrong dates. Spring was in November, and Fall was in March. Other not - as - glaring errors and optimizations in this section of the main code. Still no promises, but at least the worst, and most obvious errors were fixed. -- Another DST related error in the Daytime connection to the time server. 2 issues caused the initial connection to the Daytime server (port 13) and determination of whether DST was in effect to fail. -- Fixed. Initial Connection to the Daytime server, can of course fail due to external problems, but it seems to work most of the time. -- The 1 minute timer is now synced to seconds. Alarms occur on the minute, or approximately 1 second after. The movement of the display in clock only mode uses this, so the clock moves on the minute, and not at a random number of seconds. Startup time reduced to 5 seconds. Depending on how you connect to the NodeMCU, this should not be a problem if you need to "file.rename("init.lua","not_init.lua")", or similar. When an alarm is playing, the relevant sound file is (obviously) open each time the sound is playing. If the user then requests (or refreshes) the web page, the webserver must open the relevant HTML file. While newer NodeMCU firmwares will allow 2 files to be open at once, the version I used did not. The result is that there is a very high probability of a crash when attempting to cancel an alarm or hitting snooze. While a crash serves (in a rather un-elegant way) to silence the alarm, and the clock resumes normal function after it reboots, this renders the snooze function unusable. Newer versions of NodeMCU have serious issues with End User Setup, so I have to stick with the old firmware for now. Given the current state of NodeMCU, this may never be fixed. Punctuation in the Alarm Messages still causes messages to be displayed "funny" (control character codes are displayed). In addition to the above, more checks for valid inputs (settings) are needed. Ex: Proper format for Alarm Time. Weather not yet implemented. Still anticipating possible memory problems when this code is added. 11 March 2017 DST change did not work correctly due to glaring errors in the DST related code. Spring Forward and Fall Back tied to wrong dates. Spring was in November, and Fall was in March. 2 issues caused the initial connection to the Daytime server (port 13) and determination of whether DST was in effect to fail. There seems to be another error causing cross talk between the settings for DST and 12/24 hour time display. More research on this bug (if it actually exists) is needed. I hope to also come up with a work around for Issue 1 mentioned in the previous post. Working with the Chuwi Hi12 from a Linux host is easy! NOTE: What is below should work with other similar Chuwi tablets, such as the Hi10 and Hi8, but please make sure you have the correct firmware for your Tablet. WARNING: What is below is for Chuwi Hi12 tablets that were Factory Capable of dual booting. This may not work, and may permanently disable older versions of the Chuwi Hi12 that were originally sold with Windows only. WARNING: What is below will Delete all Partitions and Delete all Data -- Android and Windows. It will delete Windows and All Data even if you do not intend to remove Windows. Even if Windows is working, you must backup all data in both OS's. Deleting Windows is necessary due to the way the EMMC is partitioned from the factory, not because this is a Linux web site. NOTE: What is below does not flash the BIOS, so it is relatively safe given the above Notes/Warnings are heeded. The following instructions work for the following cases, and may work for others. 1.) You want to erase Windows, and use Android (or possibly Remix) only. 3.) You have installed Ubuntu or another os, and altered or deleted the factory partitions. As long as you can boot into the BIOS, what is below should work. -- A Chuwi Hi12 Tablet -- Obviously -- We call this the "Target"
-- A Desktop or other computer running Ubuntu 14.04 or 16.04, or similar Debian Based Linux -- We call this the "Host". -- A good quality USB cable. -- The The "flash-no-erase-all.json" file from the same link as the official firmware -- If, and only if you want to try to keep Windows, although as mentioned, I cannot guarantee that your Windows partition/data will not be wiped even with this file. I have no interest in using Windows, so I did not test this. In other words, you essentially need one of those 2 files, but never both. No USB drivers are needed for Linux, but you may need to ensure you have permissions to the relevant USB device. There are many articles on adding a udev rules for android devices. Install Intel® Platform Flash Tool Lite. This can easily be done with the Ubuntu Software Center. Unrar the Official Android Firmware. (Right click and select Extract Here), then extract the zip. Keep the original rar and zip files. Copy the flash-no-erase-all.json into the un-zipped firmware folder. Note the existing flash.json in the same location. Extract the gpt.bin file. Replace the gpt.bin file in the un-zipped firmware folder with this one. Start Intel® Platform Flash Tool Lite. Using the blue "Browse" button near the top, navigate to the Folder Containing the firmware (the un-zipped one). Select the appropriate .json file in that folder. Make sure the correct file is shown next to "Flash File:"
Power off the Chuwi Tablet if it not already off. Press and Hold the Vol +, and Vol - buttons, in other words, hold both sides of the volume rocker down. Simultaneously Press and Hold the Power Button until the tablet powers on. Continue to hold Vol + and Vol -, but you can release the Power button once you see the Chuwi Logo. Continue holding the volume rocker until you see "DNX FASTBOOT MODE.." in small yellow letters near the Chuwi Logo. Connect the USB cable from the host to the Micro USB port on the target. Verify the device shows up in the Intel® Platform Flash Tool. Press the Blue "Start to Flash" button. In a few seconds, the target will reboot in recovery mode. Flashing should take less than 5 minutes. When complete, the tablet will reboot twice. Do not touch the tablet as it reboots, it may be doing a touchscreen calibration. The Chuwi Tablet will boot in Chinese language, and with Chinese apps. Select Settings (the blue/grey gear). Select the settings icon that looks like a globe. The first item in the globe (Language & input) menu is the language. Erase any unwanted Chinese apps using Settings --> Apps. 1. My current Source Code (as in the source thread) contains a fairly blatant bug. When an alarm is playing, the relevant sound file is (obviously) open each time the sound is playing. If the user then requests (or refreshes) the web page, the webserver must open the relevant HTML file. While newer NodeMCU firmwares will allow 2 files to be open at once, the version I used did not. The result is that there is a very high probability of a crash when attempting to cancel an alarm or hitting snooze. While a crash serves (in a rather un-elegant way) to silence the alarm, and the clock resumes normal function after it reboots, this renders the snooze function unuseable. 2. Newer firmwares allow 2 files to be open at the same time, but have another problem. The End User Setup module is being really written, but currently contains bugs that prevent its use. This issue can be fixed by having "handshakes" between the web server and the sound player to avoided having 2 files open at the same time, or wait for a multi file firmware that works, and rewriting the source accordingly. 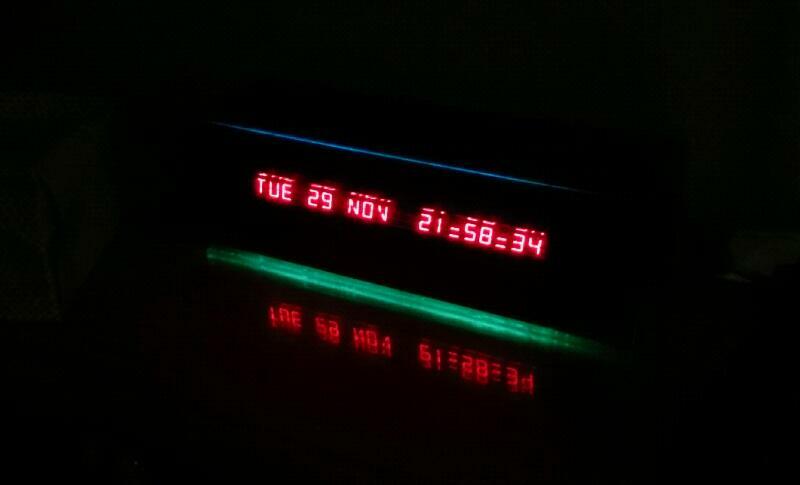 My Clock is very near initial release (source code release). Both Alarms, Including saving the settings. Saving basic display settings, and restoring them on next boot. More aggressive attempts to contact the SNTP server if a timesync fails. It now will attempt a time sync every minute for 10 minutes if there is a sync fail. This is both on the initial sync, and on hourly syncs. If after 10 tries, there is still no successful sync, it displays a different message, and does not try again until the next regular hourly attempt. In no case have I seen more than 8 consecutive tries fail. Web pages for Main Settings and both alarms now correctly show current settings when set/viewed, including across a re-boot. Alarm text was loosing formatting across a re-boot - Fixed. Crash on Alarm if unit had been re-booted/power cycled - Fixed. Error in display of alarm days. - Fixed. Distribution of the code has been delayed to allow these features to be in the initial release. I have added basic "Factory Reset" functionality. Upon selecting Factory Reset from the main page, a confirmation page is displayed. Upon confirming, the settings files are deleted, all settings are set to default, and the Web pages are re-written. The AP is then set to defaults. This deletes WiFi passwords, and causes End User Setup to run on boot. I received the red plexiglass, and it looks awesome. There are still a few light leaks on the top and sides, but "production" units will not have this. The bottom is a clear, but dotted, and much thicker piece of plexiglass. There is some light leakage out the bottom, but with the unit up on little rubber feet (LRF), this light leakage looks really cool, and is not significant enough to interfere with sleep (Opinion, not a medical evaluation), so I am planning to leave it this way in the next one(s) I make. I also came up with a really simple solution to the clicking noise -- Install the back panel. It attenuates the clicking significantly, but the Alarm tones are still more than loud enough. This is only a solution for the prototype. I still need to order some audio amplifier modules for the "production" units. Web pages show default settings, not current/saved settings (except network settings, which works as expected). Dynamically saving/generating the settings pages will require more code. This topic has been moved to NodeMCU IoT Clock by Administrator.